Pharmaceutical Name: Hirudo seu whitmaniae. Part Used & Method for Pharmaceutical Preparations: The leeches are caught from May to June or in autumn. They are killed and dried in the sun, and then pounded into powder or carbonized. Properties & Taste: Salty, bitter, neutral and slightly toxic. Functions: 1. To invigorate blood and remove stagnation; 2. To promote menstruation. 1. Amenorrhea or abdominal and epigastric masses caused by blood stagnation. Leech (Shuizhi) is used with Peach seed (Taoren), Burreed tuber (Sanleng) and Chinese angelica root (Danggui). 2. Chest pain, abdominal pain and constipation caused by blood stagnation due to external injury. 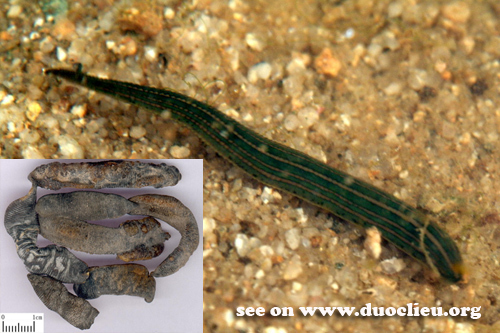 Leech (Shuizhi) is used with Pharbitis seed (Qianniuzi) and Rhubarb (Dahuang) in the formula Duoming Dan. Dosage: 3–6 g, decocted in water for an oral dose; or 1–1,5g, used in powder form. Cautions & Contraindications: It is slightly toxic and contraindicated during pregnancy.